The competitions of the 25th Azerbaijan Championships in Rhythmic Gymnastics are being held very well, coach of the Ojag sports club Aysel Allahverdiyeva told Trend on Dec. 6. "The gymnasts try to demonstrate the best result at the competitions,” she said. “The tournament has been organized at a very high level. There are a beautiful hall, lighting and music in the National Gymnastics Arena. All the conditions have been created for the gymnasts." 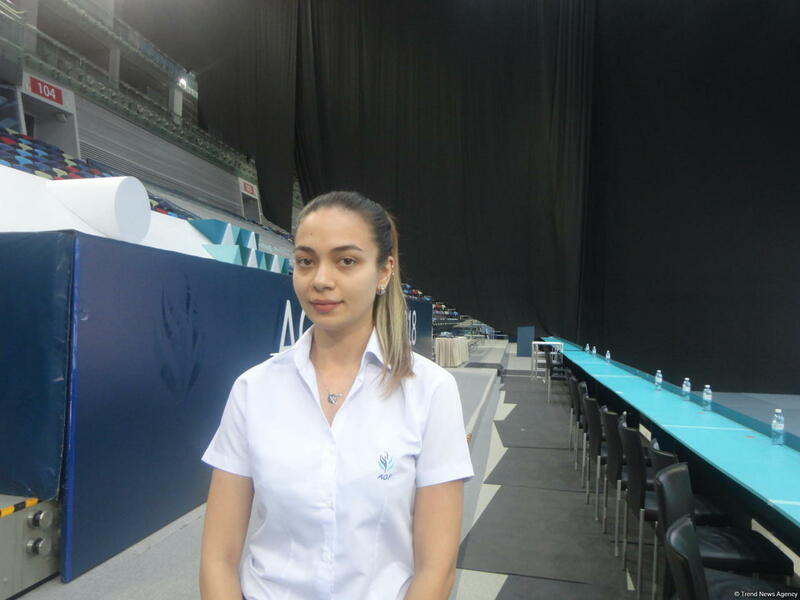 "The performances during the competitions in the National Gymnastics Arena motivate gymnasts and give an impetus to achieve great results," she said. The first day of the 25th Azerbaijan Championship in Rhythmic Gymnastics kicked off in the National Gymnastics Arena in Baku on Dec. 6 and will run till Dec. 9. Within the first three days, the individual gymnasts will compete in the age categories of “youngsters”, “pre-juniors”, “juniors”, while the teams in group exercises will be divided into the age groups of “youngsters” and “pre-juniors”. Among the competitors, there are the representatives of “Ojag Sport” club, Baku Gymnastics School, Republican Complex Sports School, “AyUlduz” club, Zirva International Sports Club, Sarhadchi Sports Olympic Center, Aquatic Palace, Zabrat Sports Club, as well Sumqait, Gusar, Ganja, Mingachevir, Ismayilli, Kurdamir, Shirvan and Goychay. On the last day of the events, the 5th Interregional Cup will be commenced. The representatives of Azerbaijani districts will perform in both individual and group exercises at the Interregional Cup for the 5th time. The most interesting point of the competitions appears to be on the last day. This year, the organizers will present interesting gymnastics routines with the participation of the coaches, by preparing the show of “Golden Age” as it was last year.